Perk up your morning outside with the perfect cup of coffee from the Coleman® Portable InstaStart™ Coffeemaker with glass carafe. Prepare your pick-me-up just like the home version by spooning the grounds into the removable filter basket and adding water. To turn it on, just push the InstaStart™ Push-Button Ignition Button for matchless ignition for ten cups of coffee in 18 minutes. The PerfectFlow™ Regulator will keep a constant heat, no matter the conditions: cold weather, high altitudes or low fuel. One 16.4-oz. 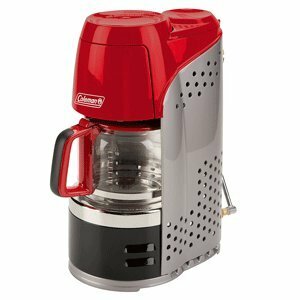 (494 g) propane cylinder will power the coffeemaker for up to 4.4 hours. This outdoor companion is perfect for camping and hunting trips or at construction sites.